There is no such thing as a non-event, cross-country flight in a 342-pound airplane; experiences abound. 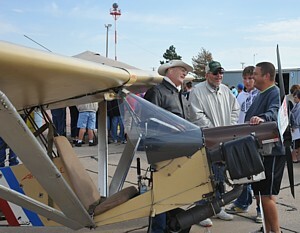 Flying from Derby, Kansas to Liberal, Kansas and attending their one-day air show provided many new challenges. I would soon learn they were unique to remote areas of our State. I like to plan flights, I like to fly, and I like multi-day trips. So, when Mary Shortridge, EAA Chapter 377 newsletter editor invited me out, I began planning. Airbike fueled, packed with gear and me aboard, I was ready to travel. It is amazing how quickly the weight of things such as oil, fuel, cold weather clothes, helmet, tent, sleeping bag, food, and display materials add up! My flight planning for the 210 mile trip to Liberal (LBL) predicted four and a half hours total time including two fuel stops. Fuel stops are critical to reaching my destination. 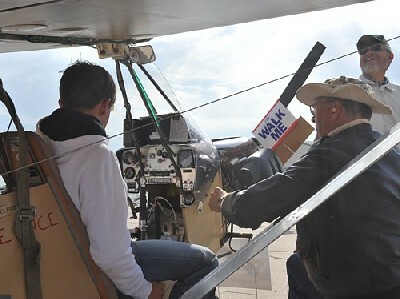 Some west Kansas airports do not sell fuel, some have limited provisions for getting fuel and some have no telephones. These conditions were to negatively affect my calls to Flight Service and for fuel. Because of these limitations, my ground track to Liberal represented a sewing machine’s zig-zag stitch. First stop for fuel was Harper (8K2) which caused me concern while circling to land. The field had two runways instead of one as listed on airnav.com. It almost looked like the Alva airport 20 miles away. I thought I had entered the wrong coordinates into my GPS and I wasn’t at Harper! I landed on the unlisted but marked grass runway. I realized later, I had erred when making my trip card, I was indeed at Harper. Not an encouraging start! Bill, a maintenance man, was on sight checking the fuel tanks as was a city employee. It was here I discovered my cell phone was “Out of network” and I couldn’t close my flight plan! Problem solved when Bill loaned me his cell phone. The city employee then called the police to unlock the tank and sell me fuel. Without their help, I was out of communication along with its associated problems. While waiting for the police chief’s arrival, another car drove into the parking lot. I asked the driver if he was waiting for someone to fly in and he answered: “No, I just wondered what all the excitement was about!” Apparently a plane flying over the small town and landing is considered excitement. I was the only plane to land during the past week! We visited awhile and I showed him my plane. Refueled, I paid my bill, filed a flight plan for Comanche (38K) (using Bill’s phone) and taxied to the grass strip. To give the four onlookers something to talk about for a week, I hit the smoke button during takeoff and climb. A beautiful plume of white smoke trailed my plane! I can just imagine them telling others at the coffee shop how I blew a piston on takeoff but the engine had two of them so it could keep going. It wasn’t long before I was flying over shallow gulches, washes, small watersheds, and a diminishing number of trees. Landmarks were non-existent as the sectional chart showed nothing that was worth documenting. Although the terrain was not featureless, there just wasn’t anything significant or useful that warranted charting. The visible features of center-pivot hayfields, an occasional donkey-head oil pump, and dried up creeks, remained anonymous. Next fuel stop was Comanche, seventy miles distant. Flying into gently rising terrain, I constantly tapped the stick to maintain 1000′ AGL. Several times hawks momentarily flew next to me, then realizing I wasn’t a threat, did a steep wingover back and away. That is a neat benefit of flying a fifty-five to sixty mph airplane. 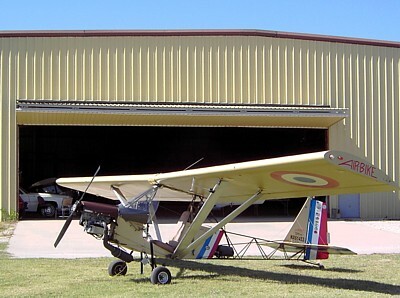 Landing on concrete runway one-seven at Comanche, a previous problem surfaced and a new one was revealed. Gary, a retiree, was the gas man and just happened to be at the airport with his yellow Labrador Retriever. What luck! He said there was nothing to do at home so he came to the airport—just to check on it! It was a good thing too, because my cell phone didn’t work here either. Communication problem solved! Next thing I know, he called three of his buddies so they could come out and see my strange little plane. Soon a crowd gathered and there was more help than I needed. Everyone wanted to do something—and talk. What an enjoyable fuel stop for all of us! This is one of the neat things about small airports. Cleaning up after refueling, I noticed a liquid dripping from under my seat cushion and puddling on the concrete. Examination determined it wasn’t water from my bottle, wasn’t oil from a punctured plastic container, and it wasn’t fuel. The only other source was smoke oil from the reservoir. Sure enough, that was the problem, when looking into the front storage compartment, I could see that oil was dripping down the reservoir’s side. It was impractical to remove the tank here to solve the leak so I just mopped up the mess in the cockpit floor and stuffed shop rags in various places to absorb the “continuing leak.” I would solve this problem when arriving at Liberal. Western Kansas is as bleak as anywhere in the Australian outback. There are NO trees, No towns, only an occasional farm, and lots of “crop circles.” Deep-well, center-pivot irrigation makes it possible to sustain crops, other land is devoid of agriculture. Crops provide animal food for those in feedlots. 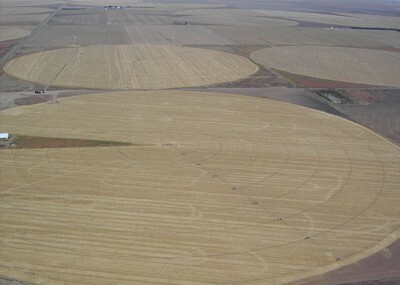 The crop circles do however, provide interesting patterns unseen in regions with ample rainwater. That white line is not a road—it’s a very LONG runway! The land is almost flat except for an occasional gulch or highly eroded area. Visibility, at even 1000′ AGL, is perhaps thirty-five to forty miles. The only signs of life are the dust devils (small harmless tornadoes) dancing across the fields like skinny toy tops. It is foolhardy to fly over desolate land masses that have not seen the foot of man or a tire track in decades, going down could be tragic. Especially since I have no ability to communicate. Hence I always file a flight plan and try to fly near signs of civilization. Those symbols are feedlots, oil pumping donkeys, cache storage sheds and what I thought was called a road. I later learned that those endless concrete ribbons on which an occasional pickup truck travels are really just l-o-o-o-n-g runways! A late afternoon eastern approach to Liberal is characterized by two (maybe three) distinct features: Huge sewage settling ponds reflect sunlight making it appear like a small lake, and a large dark rectangular area with yellow dust floating away from it is located about five miles southeast of town. The third feature becomes apparent when flying through that dust cloud—the aroma is undeniably of a feedlot. The dust cloud is created when “the cattle get to stompin’ ” as the locals say. Parked in front of Lyddon’s FBO in Liberal, Kansas—whew! The reason for this trip was to see the Air Fair 2010 featuring Kyle Franklin’s Flying Circus, Skip Stewart’s Pitts S2S show, tour the Liberal Air Museum, visit Mary and enjoy meeting the members of her EAA chapter. Also, it was an opportunity to make another long cross-country trip. Something I really like to do. 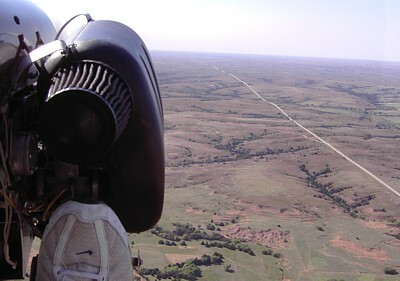 This time to western Kansas, an area I had never visited in my AirBike. Saturday dawned with mid-forties temperatures and a brisk bone-chilling wind. Even with an uncomfortable start, the day would become an exciting one. I requested and was given permission to display my AirBike next to the Young Eagles admission area. During non-air show times a steady stream of Young Eagles visited my plane, most of them sat in the cockpit and under my supervision, manipulated the controls to understand how it flew. About fifty kids sat in the cockpit, each was strapped in with the shoulder harness and had my silk scarf draped around their neck. Meanwhile parents took photos, some even accepted my invitation to sit in the cockpit. We all had a good time and I made some more friends. EAA Chapter 377 hosted a luncheon in the main hangar. Here Mary Shortridge introduced me to several of their members. I found them to be just like our EAA chapter members: friendly, outgoing, and enjoying being associated with aircraft activities. The AirBike is quite the attention-getter, it is fun talking to people about it. A cute little Porsche 914 that Mary had spearheaded the restoration of, was displayed with other cars in that part of the show. The aerial performers thrilled the crowd with what can only be described as outstanding demonstrations of flying skill, choreography and application of brute horsepower of the Waco and Pitts. I met Bob Baker, owner of two P-51s, Little Rebel and Sweet & Lovely. 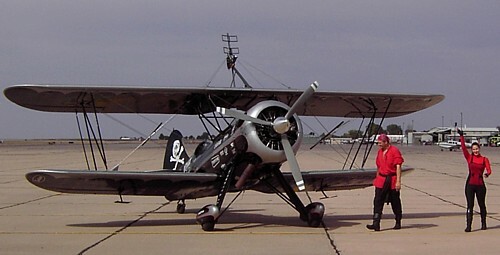 He made several high speed passes down the flight line in Little Rebel, adding to the visual and audio aspect of what horsepower can do. 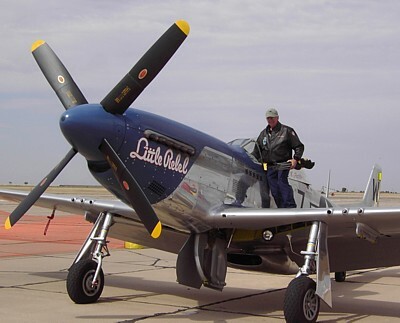 Bob Baker, owner/pilot, of Little Rebel; a P-51 Mustang. Later that evening, as Kyle and Amanda were disassembling their Waco for transport to the next air show I asked Amanda for her “Bombshell” poster. She cordially responded and addressed it to “AirBike Ace!”. I thanked both performers for their act and interacting with the crowd. Even though I had seen them the previous weekend at the Wichita Flight Festival, it was a thrill to watch them perform again. 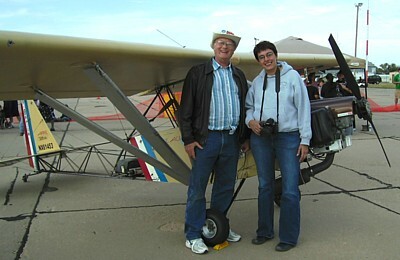 Kyle and Amanda Franklin exiting their Waco following a nail-biting performance of wingwalking and aerobatics. Sunday morning my phone alarm buzzed me awake at 6:30 AM. The plan was to be airborne for home by 8:00 AM. Looking outside, I saw a light rain falling. I went back to bed for another hour. Trying again at 7:30 AM, it was still raining and the sky was overcast. Bob Baker and I examined the computer weather in the pilot planning room. I called Flight Service. Net result was to wait a couple of hours or so to let the bad weather with imbedded thunderstorms between us and our destinations blow away. I took the courtesy car to get breakfast. Returning to the airport, Bob was taxiing out while I loaded my plane. Because I would again have no phone service at either outbound airports, I would go home another way. I could not risk failing to call Flight Service to close my flight plan. Calling Meade (MEJ) airport I left a voice mail on the agricultural flight service’s answering machine. Being Sunday, I assumed the office was closed but at least they did have a land line. Off I went to my first fuel stop with the next one at Pratt (KPTT). The FBO at Mead Airport was out of business, but he came from his his home Sunday morning to refuel me. What a favor, without his help I would still be there! Landing at desolate Meade Airport, it looked more forlorn than any mining ghost town! A call to the ag service revealed he went out of business last month. However, he said he would come out and sell me fuel from his tanker truck. Fine, I only needed four gallons. Even though AirNav.com listed this as a viable airport with service, and the FBO at Liberal recommended it as a fuel stop, things can change quickly. Problems like this make the fuel stop take longer than the flight leg. An hour and a half later I was fueled and on the ninety-five mile leg to Pratt. It was still cold and now getting very bumpy. The heading could only be held +/- ten degrees, altitude within one hundred feet, and my windscreen alternately showed ground and sky. I held the stick with one hand and a fuselage tube with the other. I just went where I was pushed, no sense fighting it. I felt like a peach pit in a blender! Pratt was a welcome site, the sun was shining and there were airplanes on the apron next to the hangars. Entering the FBO to find someone who would pump fuel, I discovered an EAA chapter cleaning up from their pot-luck luncheon meeting. They offered me a paper plate which I immediately filled then went into the office to eat and warm up. Some of these pilots were the same ones who gave Young Eagle rides at Liberal. Pratt Airport had everything: fuel, food, heat and friendship. Fuel tanks and stomach full, I returned to the FBO office to continue warming up and resting. I was exhausted and had another 80 miles to go. I didn’t want to fly tired, the office chair was so comfortable I almost fell asleep in it. 3:45, flight plan filed for Selby Aerodrome (35KS), it was time to go. My flight path now was into a quartering headwind, I had more than enough fuel to make it to Selby Aerodrome so I pushed the throttle forward a bit and my AirBike responded by giving me a ground speed of sixty-five mph. No more need to squeeze every bit of mileage out of my fuel tanks. Somewhere around Lake Cheeny, thirty miles from home, I started feeling warmth on my back and arms. Startled that there may be a fire in my aft storage compartment I turned around to look, but instead of fire I saw a most beautiful sight—the sun! It was now low enough in the sky to let its rays sneak in under my wing and strike my arms and neck. Oh, that felt good! Entering the Selby Aerodrome pattern I set up for landing. It wasn’t a very good one, I attribute that to being tired, cold, and not correcting quickly enough for the gusty winds. Normally, I would go around and do it again so I could end a flight on a good landing. Not this time though, I doubt that I could have made it any better the second or even third time. I am down and nothing broke or fell off, head for the hangar, I said to myself. Total traveling time was eleven hours, of that, 7-1/2 was engine run time and my fuel burn was 4.5 gph using all avgas for 425 miles. 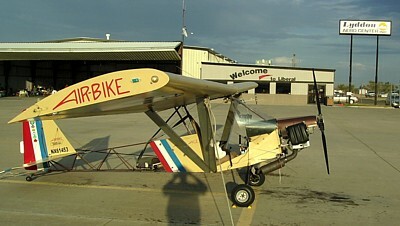 My AirBike has flown 860+ hours since its first flight in July 1998. Statistics aside, it was another great trip filled with new memories to savor and experiences to apply to future trips. My AirBike’s Rotax 503 engine ran flawlessly and reliably. 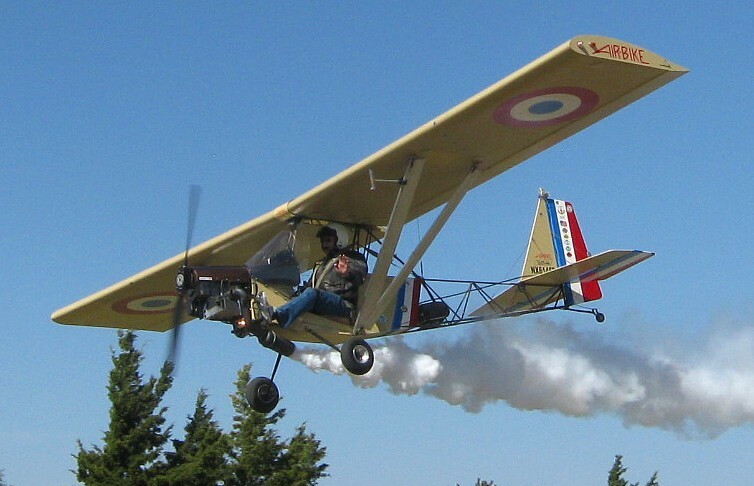 What a fun flying airplane! I was re-acquainted with old friends and made new ones. My pool of aviator friends continues to grow. I need to “pass forward” all the good things people did for me on this trip. 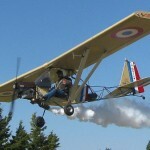 Passionate about flying? You betcha!